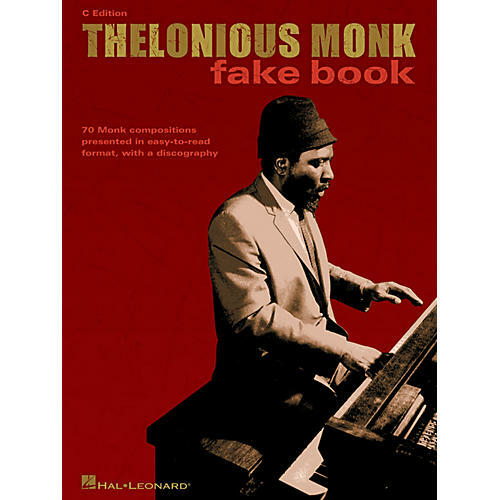 The music of Thelonious Monk is among the most requested of any jazz composer, but accurate lead sheets and sources have never been widely available - until now. This folio has 70 of the master composer/pianist's most familiar pieces, as well as a number of obscure and unrecorded tunes, in easy-to-read versions. Includes counterlines and ensemble parts for many pieces, as well as bass-lines and piano voicings where applicable. Also includes a biography, a glossary, and a definitive discography of the compositions in the book. Titles include: Ask Me Now · Bemsha Swing · Blue Monk · Blue Sphere · Boo Boo's Birthday · Bright Mississippi · Brilliant Corners · Bye-Ya · Crepuscule With Nellie · Criss Cross · 52nd Street Theme · Functional · Gallop's Gallop · Hackensack · I Mean You · In Walked Bud · Jackie-ing · Let's Cool One · Little Rootie Tootie · Misterioso · Monk's Mood · Nutty · Off Minor · Pannonica · Played Twice · Rhythm-a-ning · 'Round Midnight · Ruby, My Dear · Straight No Chaser · Thelonious · Well You Needn't · and 39 more.